How’s your knowledge of paediatric First Aid? I heard in the news recently that Asda is to be placing defibrillators in all of its 609 stores across the UK, through an agreement with the British Heart Foundation (BHF). Until last August, I had absolutely no idea that any member of the public can use a defibrillator within an emergency situation, if one happens to be available. Did you? Surely it’s something any parent should know. It’s one of the many vital lessons I learnt on a family First Aid course that I attended in the summer, organised by children’s charity Millie’s Trust. Millie’s Trust was set-up by the parents of Millie Thompson who tragically died in a choking incident in October 2012. The charity’s aim is to make First Aid training readily available to all parents, for minimal costs. I was luckily enough to secure a place on one of their one day training courses, and since I was pregnant at the time, it didn’t cost me a penny (aside from a voluntary donation). Having been through the course, I see how important it is for all parents to have had some sort of First Aid training. If only it was offered through the NHS as a postnatal service. Previously, like many parents, it was one of those things I intended to do, but had never got around to. It was only when I was pregnant with number two (four years after becoming a parent for the first time) that I thought it was something I should crack on with organising. Learning how to cope with a choking incident is probably one of the most important things every parent or carer should know. I have just begun weaning baby Wolfy, and although my newfound knowledge has made me much more nervous of choking (sometimes ignorance is bliss! ), I’m reassured that I know in theory what to do should an incident occur. Please, if you are reading this post, take two minutes to watch this video on how to deal with a baby choking. It’s upsetting to think about these things, but as parents, we need to. Since the training we now have a First Aid manual strategically placed in our lounge, which we can get at quickly in an emergency. If your short-term memory is anything like mine at the moment, it’s good to know where the instructions are should I need them. Having a well-stocked First Aid kit at home and in the car is another recommendation to pass on from my training. And following Little I’s accident a couple of summers back, I now try to keep a sachet or two of Calpol in my handbag (although you then need to make sure it’s out of reach!). But seriously, the most eye-opening part of my First Aid training was learning how anyone can use a defibrillator in an emergency situation, if there’s one to hand. Absolutely no training is needed. 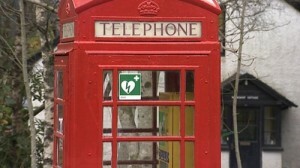 The BHF is currently on a drive to install them in as many public places as possible, and they can usually be found where you see a green sign of a heart with a lightning bolt through it. A defibrillator will only deliver a shock if it’s needed, so there’s no need to worry about sending an electric shock to a heart that doesn’t need it. They are designed to be ‘plug n play’, if you can call it that, and once turned on are very easy to use if you follow the audio prompts (if I can use it, anyone can!). When you look at the stats as to how drastically survival rates increase with the use of a defibrillator, versus CPR, it brings it home how important they are to have in public places. In an ideal world, every school should certainly have one. So if you haven’t yet been on a First Aid course, I urge you to make it a priority for this year. Don’t leave it as long as I did! Millie’s Trust is certainly worth checking out, as are local Children’s Centres and the NCT also organises affordable courses. If you have any other courses to recommend, please do so below.